ZEBULON, NC - The Carolina Mudcats are excited to announce that individual game tickets for the upcoming 2018 season, featuring a fully revamped weekly theme night calendar, nine souvenir giveaways, four themed game jerseys, two Dirty Dogs Spa Bark in the Park games and 15 total fireworks nights, are now available for purchase online at www.carolinamudcats.com and at the Five County Stadium front office. Box seats are $10.00, premium field level seats are $12.00 and Cattails Skybox seats are $15.00 for the upcoming 2018 season. Season ticket plans, group ticket packages and the latest Fishing License mini plans are also all available now by visiting the Five County Stadium front office in Zebulon, by calling (919) 269-CATS (2287) and by visiting www.carolinamudcats.com/tickets. Carolina's new season officially begins on Thursday, April 5 with Opening Night 2018 versus the Winston-Salem Dash at Five County Stadium. Box seat tickets, however, will be dropped to just $8.00 for Marked Down Mondays and each Monday night home game at Five County Stadium during the 2018 season. Marked Down Mondays will feature free parking (only available for Marked Down Monday games), $8.00 box seat tickets and food specials including $1.50 hot dogs, $3.00 hamburgers and $2.00 popcorn. Both the free parking and $8.00 box seat ticket promotions are only available for Marked Down Monday games on April 9, May 21, May 28, July 2, July 16, August 6 and August 27. The Mudcats' revamped weekly theme night begins with Marked Down Mondays featuring free parking (only available for Marked Down Monday games), $8.00 box seat tickets and food specials including $1.50 hot dogs, $3.00 hamburgers and $2.00 popcorn. Both the free parking and $8.00 box seat ticket promotions are only available for Marked Down Monday games (April 9, May 21, May 28, July 2, July 16, August 6 & August 27). The all-new recurring weekly theme nights also includes Taco Tuesdays featuring $1.00 tacos, Bright Leaf Hot Dogs Dollar Dog Night every Wednesday with $1.00 hot dogs, Thirsty Thursday drink specials, Friday Night Fireworks and Muddy's Buddies Kids Club Sundays. The souvenir giveaway slate includes magnet schedules (April 5 - April 8), clip-on beards (April 21), Bud Light pint glasses (May 5), Brewers throwback t-shirts (May 12), cowboy hats (June 23), BBQ mitts presented by Budweiser (July 14), aviator sun glasses (August 4) and wrestling masks (August 18). The Mudcats are also planning on giving away three (3) PlayStation4 consoles, three (3) Xbox One consoles and one (1) Xbox One X to participating fans attending Gamer Night on Saturday, June 9 at Five County Stadium. 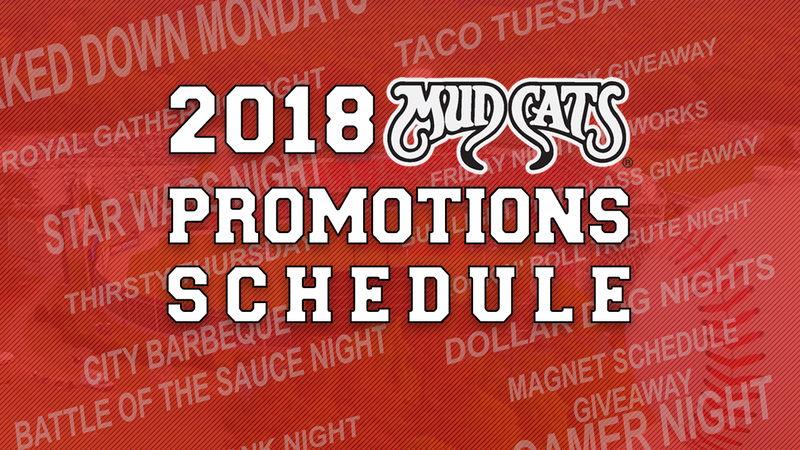 Special upcoming promotion nights also include First Responders Night (May 26), Battle of the Sauces Night presented by City Barbeque (July 14), Christmas in July (July 20), Muddy's Birthday Party (August 3) and Dirty Dogs Spa Bark in the Park games, where fans can watch the Mudcats with their favorite K9 companion(s), on Sunday, June 10 and Thursday, July 26. Carolina's new promotions schedule also includes Star Wars game jerseys for Star Wars Night (April 21), throwback jerseys presented by Wal-Mart for Brewers Throwback Weekend (May 11 - May 13) and Rock N' Roll jerseys for Rock N' Roll Tribute Night (August 4). Much like the 2017 season, the Mudcats will additionally wear patriotic themed jerseys on May 28 for Memorial Day, on July 3 and July 4 for the Mudcats for America Series and on August 31. Escape the Monday gloom with the Mudcats and Marked Down Mondays at Five County Stadium. Every Monday home game in 2018 will feature free parking*, $8.00 box seat tickets and a food menu including $1.50 hot dogs, $3.00 hamburgers, $2.00 popcorn and $2.50 single scoop ice cream. *The free parking promotion is only available for Monday home games. Taco Tuesday comes to Five County Stadium in 2018 as the Mudcats introduce $1.00 tacos available for every Tuesday night home game. (Excludes the 2018 All-Star Classic presented by US Foods on Tuesday, June 19. Also excludes Tuesday, July 3). Every Wednesday night home game in 2018 will be Dollar Dog Night presented by Bright Leaf Hot Dogs, featuring $1.00 hot dogs available throughout the Five County Stadium concourse. (Excludes: April 11, April 25, May 23, July 4 and July 25). Thirsty Thursday, a Minor League Baseball and Five County Stadium staple, returns for the 2018 season. Fans attending every Thursday night home game in 2018 can enjoy drink specials including half priced draft beer and $1.00 12 oz. soft drinks. The Mudcats are well known for their post-game fireworks shows and the 2018 season will be no different. Once again every Friday night home game (as well as select other dates) will be followed by the best post-game fireworks show in Eastern North Carolina. Every Sunday home game will once again feature free tickets for members of the Muddy's Buddies Kids' Club. Muddy's Buddies memberships are available for kids ages 12 and under and are available online at www.carolinamudcats.com and by calling (919) 269-CATS (2287). The first four games of the new season, including Opening Night 2018 on Thursday, April 5, will feature a free 2018 season magnet schedule for the first 5,000 families as they enter through the Five County Stadium gates. The magnet schedule giveaway begins on Thursday, April 5 and runs through Sunday, April 8 while supplies last. The ever-popular Star Wars Night returns to Five County Stadium on Saturday, April 21. The first 1,200 kids ages 14 and under will receive a free clip-on beard souvenir item as they enter through the Five County Stadium gates. Muddy, Muddy! Join the Mudcats as they toast the Royal newly weds on Royal Gathering Night on Saturday, May 5. Fans ages 21 and older will receive a free souvenir Bud Light Pint Glass as they exit through the Five County Stadium (while supplies last) gates. Roll back the clock with the Mudcats and Brewers Throwback Night on Saturday, May 12. The first 1,200 fans ages 15 and older will receive a free Brewers and Mudcats themed throwback t-shirt as they enter Five County Stadium. Gamers of all ages will have a chance to win a free gaming console courtesy of the Mudcats on Gamer Night scheduled for Saturday, June 9 at Five County Stadium. The Mudcats' Gamer Night giveaway will include three (3) PlayStation4 consoles, three (3) Xbox One consoles and one (1) Xbox One X. It will be a honky-tonking good time at Five County Stadium when the Mudcats go full country with Honky Tonk Night and cowboy hat giveaway night on Saturday, June 23 in Zebulon. The first 1,200 fans ages 15 and older will receive a free Mudcats themed cowboy hat as they arrive through the Five County Stadium gates. The Mudcats will hand out a free souvenir barbecue mitt presented by Budweiser on Saturday, July 14 for City Barbeque Battle of the Sauce Night. The first 1,200 fans ages 21 and older will receive this one-of-a-kind souvenir and have a chance to help settle the age old debate of East Carolina vs West Carolina BBQ with the Mudcats at Five County Stadium. Wear your sunglasses at night with the Mudcats for Rock N' Roll Tribute Night on Saturday, August 4 at Five County Stadium. The first 1,200 kids ages 14 and under will receive free aviator sun glasses courtesy of the Mudcats as they enter through the gates. Rock N' Roll Tribute Night also features special Rock N' Roll themed game jerseys. The first 1,200 kids ages 14 and under in attendance on Saturday, August 18 will receive a free souvenir wrestling mask at Five County Stadium. The ever-popular Star Wars Night returns to Five County Stadium with the Mudcats taking the field in specialty designed Star Wars themed jerseys on Saturday, April 21. The Star Wars jerseys will be made available to fans for purchase through an online auction at auctions.carolinamudcats.com. All proceeds from the online jersey auction will benefit the JDRF Triangle/Eastern NC Chapter. Star Wars night will also include a souvenir beard giveaway for the first 1,200 kids ages 13 and under through the Five County Stadium gates. Brewers Weekend begins on Friday, May 11 and will feature the Mudcats playing in Milwaukee Brewers inspired throwback jerseys for three straight games at Five County Stadium. Brewers throwback weekend includes Friday Night Fireworks on May 11, Throwback T-Shirt Night on May 12 and Mother's Day on May 13. Following the series, the throwback jerseys will be made available to fans for purchase through an online auction at auctions.carolinamudcats.com. All proceeds from the online jersey auction will benefit the Children's Miracle Network. Wear your sunglasses at night with the Mudcats for Rock N' Roll Tribute Night and a special Rock N' Roll Tribute game jersey on Saturday, August 4 at Five County Stadium. The Rock N' Roll tribute jerseys will be made available to fans for purchase through an online auction at auctions.carolinamudcats.com. All proceeds from the online jersey auction will benefit the Make-A-Wish Foundation of Eastern North Carolina. Rock N' Roll Tribute night will also include a special aviator sun glasses giveaway for the first 1,200 kids ages 13 and under. The Mudcats invite fans to help them honor the men and women of our armed forces as they wear patriotic themed jerseys on four separate dates (May 28, July 3, July 4 and August 31) throughout the season. The special patriotic themed jerseys will be auctioned off later in the year via an online auction at auctions.carolinamudcats.com. The net proceeds raised from the patriotic jersey auction will benefit Hire Heroes USA.